Snow Removal & Management — Rock Salt vs. Ice Melt? Each winter, homeowners and businesses alike are often advised to stock up on rock salt or ice melt. These products allow them to eliminate the snow and ice on walkways, driveways, and parking lots and keep people safe from slips and falls. While people often assume that these two are one in the same or interchangeable, this is not the case. 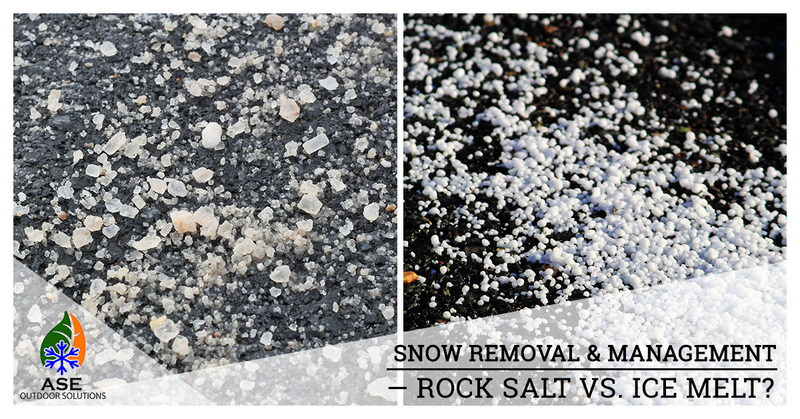 As an outdoor solutions company that specializes in providing the Barberton area with residential and commercial snow removal and management, we would like to share with you some information regarding the key differences between rock salt and ice melt. Also known as halite, rock salt is comprised solely of the mineral sodium chloride. For years and years, this has been the go-to product for melting ice during the winter. It works by penetrating the surface of the ice and forming a brine-like solution of water and salt. Since salt water has a significantly lower freezing point than base water, the ice will then start to melt. On top of this, rock salt also provides the surface with grit and gravel-like particles that help increase traction on the surface, which helps reduce slips and falls. Rock salt is relatively inexpensive and remains one of the cheapest ice melting products on the market. This is one of its top benefits. Additionally, the low freezing point of rock salt (25 degrees Fahrenheit) makes it a highly effective snow and ice remover. Despite its low price and effectiveness, it does have a few downfalls. Specifically, rock salt can be harmful to plant life and should, therefore, not be used near areas of vegetation. Also, because of its ability to cause gastrointestinal disorders in pets, it can be dangerous to all of your animals. Whereas rock salt is comprised solely of the mineral sodium chloride, ice melt is a blend of sodium chloride with other minerals, like magnesium, potassium, or calcium. Ice melt made of primarily calcium chloride is perhaps the most effective type and also the most widely used. Part of what makes ice melt so effective is its ability to not only form a brine to melt the ice but also generate chemical heat. Because its capability of generating chemical heat, ice melt is able to melt ice faster than other products. This is one of its greatest benefits. In addition to this, it is sold in a number of varieties that can meet your specific needs. For example, you can find ice melt that is able to work down to -25 degrees Fahrenheit, pet-friendly, environmentally friendly, and so on. Which Is Better For Your Home or Business? The best choice for you is dependent upon the individual needs of your home or business. If you have pets, lots of plants, and live in an area where temperatures regularly drop below 25 degrees Fahrenheit, it may be wise to go with ice melt. On the other hand, if you have a long sidewalk and live in a place where temperatures don’t often drop below 25 degrees Fahrenheit, rock salt may be the way to go. Want to Leave It to a Snow Removal Company? Don’t want to choose between rock salt and ice melt? Wish you could just call someone who could make all of your snow and ice problems disappear? You can! If you are in the Barberton area (our service area, which includes much of Medina and Summit County), we can help with all of your commercial or residential snow removal and snow management needs. Learn more here and contact us today to get started.